English Harbour Five year rum awarded a double gold award for the second consecutive year at the 2005 San Francisco Spirits Competition. English Harbour Five Year Rum continues to win international prestigious awards. The five year rum received a Double Gold Medal Award for the second consecutive year in the prestigious San Francisco World Spirits Competition in the USA, ranking English Harbour Five year Rum as one of the Best Rums in the world. Held in March 2005, the San Francisco World Spirits Competition's expert panel of judges conducted blind taste tests, over a total of 589 entries from over 43 countries, awarding medals based on taste alone. 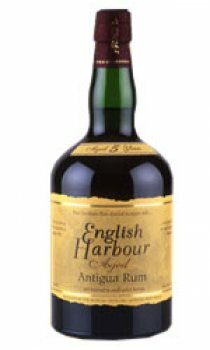 English Harbour Five year Rum is Antigua Distillery's latest product entry into the rum category and was introduced with success to consumers in the USA in May, 2004 and Japan in October 2004. Other awards were won for the English Harbour Extra Old Rum ,the English Harbour Gold Rum and English Harbour White Rum. English Harbour Five year Rum's polished copper hue prepares the drinker for the initial impression of cherry, oak and a wisp of smoke. The first sip of ripe apple, coconut and hints of cinnamon fill the palate. Then the slightly sweet coconut, spice and smoke finish complements the body of the mature spirit. Mixology possibilities are endless. This delightful rum can be consumed straight, on the rocks, with water, in making rum espresso martinis or with any of the world's popular mixers. A good sweet, caramel tasting rum, hints of bourbon oak. Good.